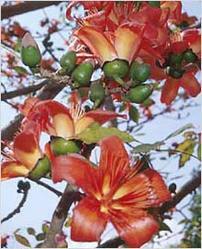 Common Name : Red Silk Cotton Tree, Cotton Tree, Indian Bombax, Kapok . Part Used : Roots, Gum, Bark, Flowers, Seeds. Habitat : It is found in eastern-himalayan regions, abundant in assam and west bengal. Uses : The roots are sweet, cooling, stimulant, restorative, astringent, alternative, , demulcent, emetic and tonic. It is used in the treatment of diarrhea, dysentery, menorrhagia, styptic and for wounds. The gum is cooling, astringent, stimulant, , tonic and demulcent in nature. It is useful in dysentery, hemoptysis, pulmonary tuberculosis, influenza, burning sensation, menorrhagia and enteritis. Bark is mucilaginous, demulcent, emetic and tonic. Used for healing wounds and to stop bleeding. Flowers are astringent and good for skin troubles and haemorrhoids. Seeds are useful in treating gonorrhea and chronic cystitis. A paste made out of prickles is god for restoring skin color especially on the face. Young fruits are useful in calculus affections, chronic inflammations and ulceration of bladder and kidney.